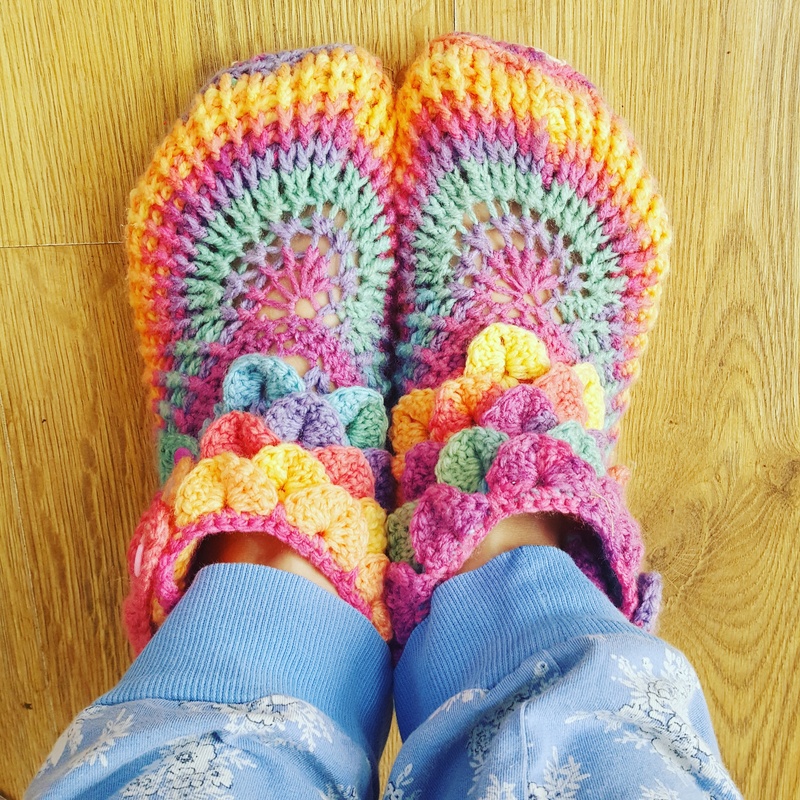 Only 9 days after starting my slippers, I finished them. You may now well be thinking ‘great’ or ‘what’s that got to do with the price of eggs?’ The thing is, those slippers represent a personal achievement. Not a huge thing, but I bought the pattern two years ago. Two years ago I also tried to make them, using some pretty rainbow coloured wool that I bought in Aldi. My attempts were very poor, I only got the sole of one slipper made before giving up. You see, the yarn was one of those fluffy ones that also varies in thickness, so I couldn’t see where my stitches were. As well as that, I read the instructions and realised (or rather, just decided), that I couldn’t do it as I did not have a clue how to work around the post. (Apologies to my non crocheting readers for the technical jargon, I felt the same when I read that in the pattern.) The sole was frogged, as far as I could, and then the yarn was a tangled mess which went in the bin. I could have kept going, but I think I’d have ended up getting cross. That was it, I worked on other projects (for two more years) that were far simpler and I learned a lot. The other week I decided to try again, I had plenty of yarn and the yearning to try a new thing. 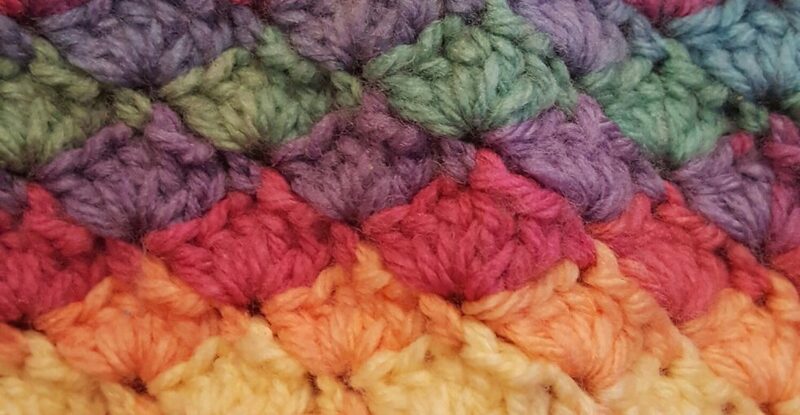 Since my first attempt, my crochet has sped up, my technique has improved and I have mor experience with using different stitches. I was no longer fazed by working around the post after making Sophie’s Garden, and I was the proud owner of 6 new stitch markers which Mr C bought me for Mother’s Day, meaning I could do all the fiddly counting. Yesterday morning was the first today of my Easter holidays and my son and I were awake well before my daughter, so we went downstairs to watch TV. 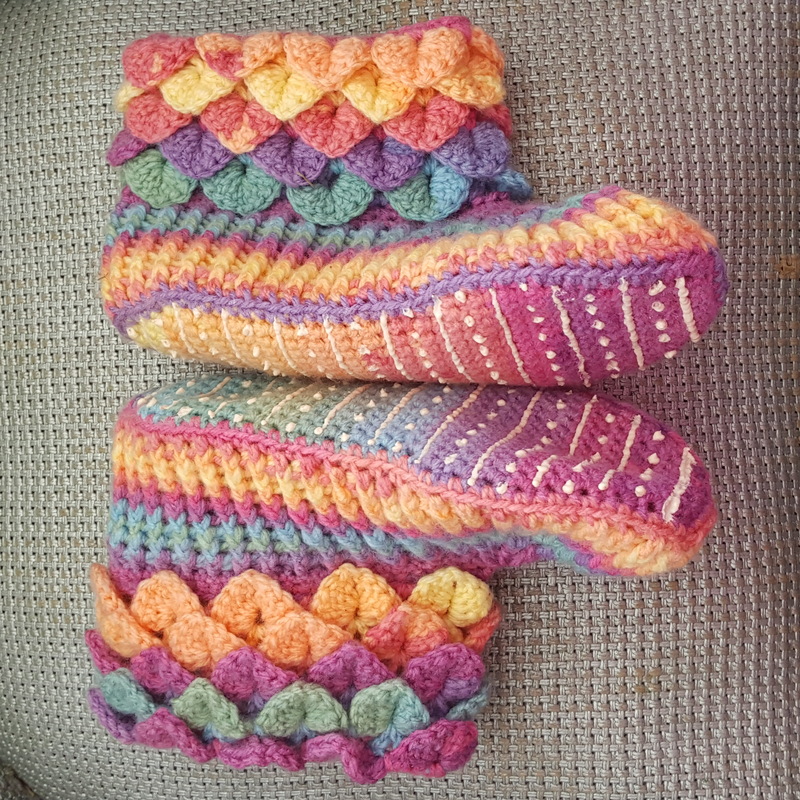 I indulged my self in some early morning crochet and got them finished, and added sock stop to the soles. They were ready to wear by this morning, and they’re super comfy and warm. Every time I wear them, I am reminded of the need for perseverance. Although my perseverance in this case was more of a ’round the houses and come back to it’ approach, as opposed to ‘just keep hammering at it until you crack it’, I still feel proud. Proud that I tried again, proud that I achieved my goal, and proud that they actually fit! I’d definitely recommend the pattern, which is available to buy from Ravelry. It’s by Bonita yarns and although it’s challenging, it includes all sizes from baby to adult. In these rainbow colours they make me think of fairies and woodland elves. I even have enough yarn left to make a baby pair, which I’m considering making as my entry into our village show later this summer. Have you ever found something tricky, come back to it after after a while and suddenly been able.able to do it? It’s ice yarns magic lights, I adore it. I bought 1200g and have made 2 mermaid tails, a chevron blanket and these and still have 100g left! I got mine through eBay, though I’ve heard good things about their site too. Enjoy making them! Thank you, I love my ice yarns rainbow yarn! Really pretty!! I wish I could crochet…what was the first crochet thing you ever made? Cheeriest pair of slippers I have ever seen! You are like a rainbow elf. Awesome! They are beautiful! Congrats on finishing them. I have about 100 patterns that I bought and never started and about half a dozen projects I started but gave up on. When it comes to knitting or crocheting I can never get my tension right so my pieces are all wonky and I give up. I am trying to see how I do with a loom. I tried but so far my tension is bad on that too. Perhaps I need to relax and just have fun with it. I love your slippers though. They are beautiful! Those are so wonderful!!! I am going to have to check pinterest for a pattern similar! Love them. Georgeous slippers 🙂 and I love the pattern of the latex- when I put some on slippers, I went for hearts and stars! I will probably try something more similar to yours if I ever make a pair for my parents! Well done, Mrs Craft – goes to show perseverance is key! Very colourful. Thank you, now to apply that perseverance to everyday life, like chores and job applications! These are beautiful! Well done ❤ – I can remember struggling with Willow squares, still can't do them a lump of it is in my craft box lol! Thank you. We all have a thing that’s tricky! You’ve put the fun in functional! Well done for persevering. Thank you, I’m glad I didn’t give up! Thank you, yes, the counting was definitely hard going at times! Oh how sweet! Love them and the beautiful colors! Thanks, they are very colourful, you can’t feel sad wearing them! WOW, well done, you can also add “and very pretty” to your list. I do not think I have the patiencs nowdays to do something like that, but I would love to be able to make something like that. Thank you, they look fancier than they are! I think the counting part earlier in the making meant it felt tricky though. good for you! they are lovely! Those turned out great! I couldn’t help but share this post! Kim wants to learn the “crocodile” stitch or whatever name you call it. I will have to check out this pattern to see if the pattern is one I can teach her! Can’t wait to try it! These are beautiful and I’ve now started to make a pair, inspired by your blog. I hope you don’t mind I’ve put a link to your page. I think I’m going to have to change the pattern on the sole a bit as my feet are a little bit bigger/wider than the large size allows for. How much do you think that will affect the pattern later? Do you think I will be able to adapt it easily, or does the pattern rely on there being a multiple of a specific number when you single crochet round the edge of the sole? Thanks… I’ll let you know how it goes! Those a SO cute! I love the colors and the style. They look comfy too.